Full-grained cow leather (2 to 2.2 mm thick), mineral-oil tanned, unlined shaft, front part of shoe lined with cotton. Outer sole made of cork granulate bound together with nitrile rubber. 4 pairs of eyelets and 3 pairs of hooks made of metal. Made in the USA. Made on Women's Shoe Lasts. The ankle-high Iron Ranger is a heavy-duty boot suitable not only in an urban environment. 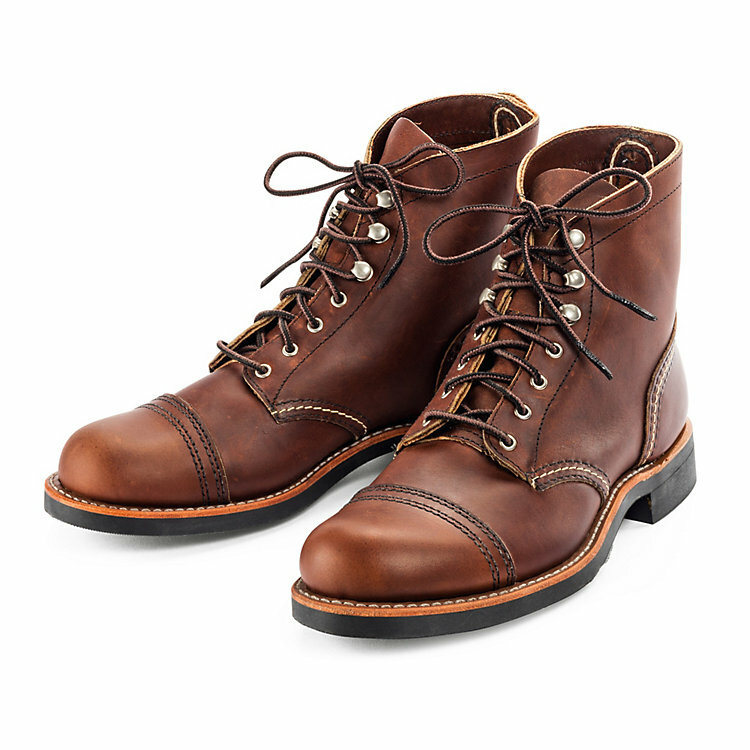 Alongside the unisex version, Red Wing is now making this model on a narrower woman's shoe last. They use their outstanding mineral-oil tanned full-grain and reinforce both, toe cap and heel construction, with additional pieces of leather. The Iron Rangers have a comfortable lace system with matt metal eyelets and three pairs of metal hooks on the shaft. Welted.